Purpose: The purpose of this program is to display a chi-squared distribution for the number of degrees of freedom specified by the user. Download: You can download this program from within Stata by typing search chidemo (see How can I use the search command to search for programs and get additional help? for more information about using search). Use of program: To use this program, type chidemo # # in the Stata command window. The first number is the optional degrees of freedom (default is 1) and the second number is the optional alpha level (default is .05). 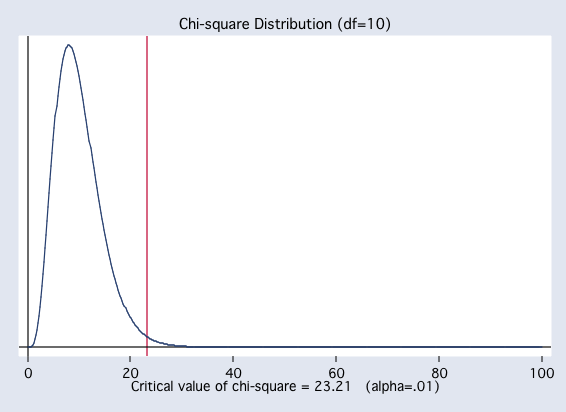 Examples: The following shows the output from issuing the chidemo command with a degrees of freedom equal to 10. 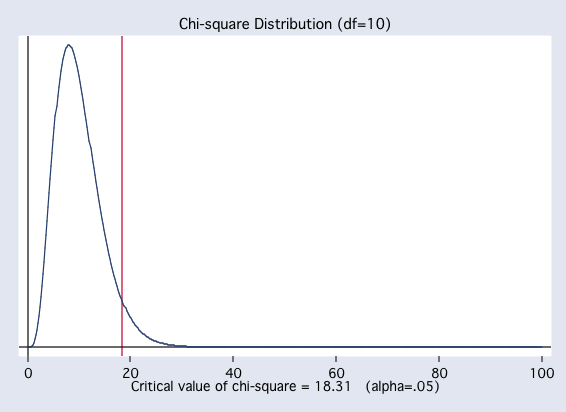 The following shows the output from issuing the chidemo command with a degrees of freedom equal to 10 and alpha equal to .01.